Stepping in or out of a traditional bathtub presents a formidable challenge for some seniors or people with mobility challenges. The risk of serious injury from slipping and falling is all too real. Not only do low step-in tubs, also known as walk-in tubs, present a practical solution to this dilemma, they can also provide several therapeutic benefits. According to data from Statistics Canada, accidental falls cause 85% of injury-related hospitalizations among seniors and 95% of all hip fractures. An estimated 50% of seniors’ falls happen when they’re at home. It’s easy to understand why: as we age we become frailer and more susceptible to injury. The StatsCan data also finds injuries suffered from falling are responsible for more deaths among seniors than either pneumonia or diabetes. Independence and safety. For seniors or adults with mobility challenges, a low step-in tub allows them to maintain their independence and dignity, to bathe in privacy, and to move in and out of the bathroom safely. When combined with handrails and non-slip or non-skid bath mats, they provide a smart, effective way to avoid hazardous falls. It will improve your overall health. Beyond preventative measures, there are added health benefits to be realized when you have an accessible bathtub, over and above improving circulation and relief for aching joints and muscles. For example, having the ability to bathe easily or shower before bedtime can increase relaxation, reduce stress, in turn allowing you to sleep more soundly. They can be therapeutic. Enjoying a nice, warm shower provides its own psychological and physical health benefits, and you can heighten the experience through chromatherapy by installing coloured LED lights in your tub or shower stall. There’s a taxation benefit. In Ontario, the Healthy Homes Renovation Tax Credit provides people aged 65 and older the opportunity to qualify for a tax credit to help ease the cost of making your home safer. However, be advised that if you plan to take advantage of this tax credit, you only have until January 1, 2017 to do so. The tub conversion process is quick and economical. It typically takes an hour or less for a Bathway technician to perform a low step-in tub installation. Best of all, the renovation methods we use are much more affordable than hiring a plumber and carpenter to remove your existing bath and install a new one. You can further reduce the risk of falling by removing obstacles and improving lighting throughout your house, maintaining a healthy diet and light exercise regimen to improve your strength and vitality, and using an assistive walking device if you grapple with gait- and balance-related issues. Ask yourself: are you doing everything you can to increase bathroom safety in your home? 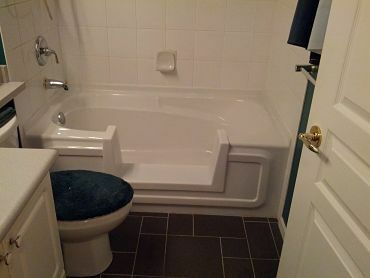 Do you have questions about converting your traditional bathtub into a low step-in tub affordably? Let’s talk. Fill out our online form and a member of the Bathway team will be in touch with you soon.